Happy Saturday! Our congratulations go out to all who braved this challenging color combination. Your designs and use of the challenge colors were amazing. With so many fabulous cards to choose from, you definitely made it difficult to select our winners! Before we get to the Headliner, let's have a look at the Design Team's selections for A Cut Above. Pauline's adorable card scores a perfect 100 on the "Cuteness Scale"! I loved her attention to detail. The perfect placement of the embossing folder on the dress just blew me away. And what about the rhinestone necklace and ribbon belt with its single "pop" of color? Congratulations, Pauline, you're our Headliner! Again, thanks to all our participants for taking on my challenge this week! Don't forget to come back tomorrow to play along with Anne Marie's Clean and Simple Challenge! Gee whiz...what a suprise! Thanks, Anne Marie, for choosing my card to be among the honorable mentions! Congrats to all the other winners too! Thank you so much to Brian for picking my card as his honorable mention - I'm delighted! And congratulations to Pauline on that stunning headliner card and to my fellow honorable mentions too! Thanks Justin for picking my card. I love playing! Oh Vicky you're to sweet. And thanks everyone for your encouraging comments on my card. I was so surprised as well that the embossing fitted so perfectly with the dress. it was like they were made for each other :) Thanks Leanne for honouring me with your kind words. So appreciate it.. Thank you, Nance for choosing my card as a cut above. I really enjoyed that color challenge, and all the cards were so very beautiful and colorful. 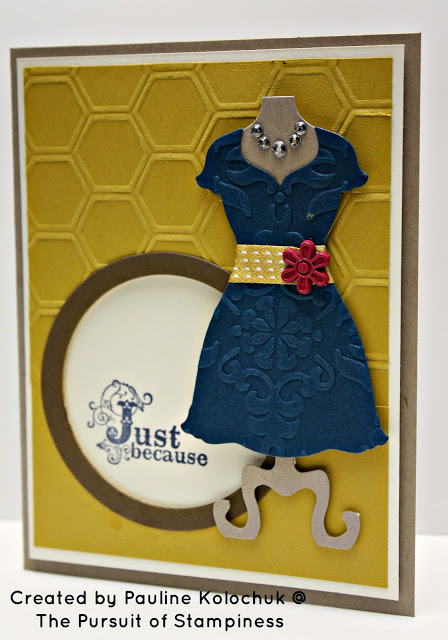 Congratulations to all of the "Cut Abov-ers" and to Pauline for her beautiful Headliner card. Thanks again, and I so enjoy playing with The Paper Players.